" SPECIAL! Purchase two boys for the price of one!! Alpacas are a lifestyle! A calm, peaceful, "kick your heals up and enjoy the day" kind of lifestyle. We are loving it and are sure you will too! We are located in Historic and relaxing Lava Hot Springs, Idaho. In a valley perfect for raising Alpacas. We are just two hours from Jackson Wyoming, the entry to Yellowstone Park. Come visit our Farm, stay at our "Alpaca Inn" and enjoy a soothing hot mineral soak or a lazy drift down the river. Our focus has been centered around breeding for Outstanding Quality, for healthy animals, superior fleece, sound confirmation, easy birthing and good milk production. We enjoy and appreciate color, but high quality alpacas come first. We'd be happy to show you around the farm, sell you an alpaca or two, or board your alpaca's here on our grassy, riverside, 10 acres just outside of Lava Hot Springs, Idaho. All sales come with a free breeding, and free boarding for 6 months. Please call for an appointment. We are a working farm. We are not a petting zoo. Visitors must be accompanied with Londa or Jody inside the pastures. Otherwise feel free to stop by and take a look at these cute Alpacas any time! Thank you for visiting our site! In our Web site you will see us, and our Alpacas (you decide who is cutest). (I think Londa is the cutest). The animals come in a close second. Hopefully you will learn something about the Alpacas and us, what got us started with these awesome animals, and how we run our farm. We sell Alpacas and alpaca products and we are happy to help you in every step of the way in raising alpacas, working with fleece or starting your business. We board them, breed them, show them (and showoff all their ribbons). 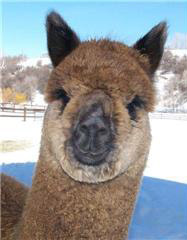 We are so into them, that we now have an Inn called, "The Alpaca Inn" in Historic Lava Hot Springs, Idaho. Just 6 miles from our farm. Check out our web site for more details, pictures of all of the rooms and activities in the area. 5513 E. Old Oregon Trail Rd.